This year I have been influenced by many readings and people. There have been times of being inspired. The hope of a leader is that she or he will inspire others. James Davidson Hunter inspired me to be “faithfully present” in order to inspire others for Christ. But to be present is more than just showing up. It is an active intent to influence others through relationship. This week Simon Sinek’s book Start with Why demonstrates that one aspect of influence comes from how well one communicates the purpose of the organization. He challenges leaders to think of their role as more than working hard, having goals and being highly educated. 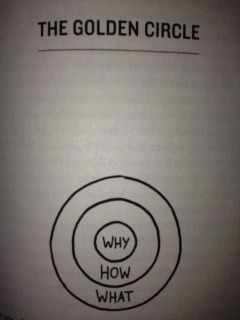 For Sinek “The why provides the context of everything else.” The purpose of what we do inspires people. Why an organization exists is the fuel that keeps it going. He states that why an organization exists is more important that how it carries out its mission or what it does. He calls this the “Golden Circle”. The leader’s role is a presence that embodies the “why’ of the organization. What an organization does and how it accomplishes it matters. But the WHY is the foundation. Two and a half years ago I took on small struggling church. Everyone was hopeful and looking forward to where we would go. This same outlook seems to be in the new people (from other churches) that check us out. There is no way everyone at first knew where I was taking the church. I didn’t know for sure either, but I did know the next step. People had to figure out where they fit in this new reality. It became clear, apparently, to some people that they did not fit. The role they had in a small church shifted as the church grew. What Sinek points out is that the transition from early adopters to the early majority is not difficult to cross if the leader knows and communicates the WHY. The early adopters are the people who know the Why. That is where the leader is to focus his to her attention. To work with the influencers is not enough. Some of the influencers before I came, lost some of that influence they had as more people were included and new leadership was established. What is the challenge for the leader is to know which influencers believe what the leader believes. Sinek reveals that,“The goal of business is to focus on the people who believe what you believe.” This was not easy at the beginning. But having a core group who knew me well made all the difference in the world. They joined the church as newcomers but quickly helped establish a new DNA. They may not have known exactly the whole WHY, but they knew the leader and trusted me. That was why enough for them. Communicating that the WHY is outside the organization of the church is even more challenging. Sinek, speaking to business leaders, cites how the marketplace is chaotic. This is the potential customers, the shareholders, the competition etc. 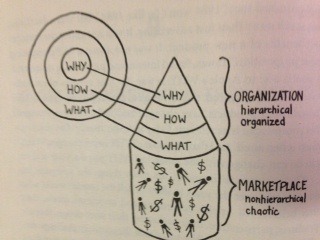 The only contact that the marketplace has with the organization is with at the WHAT level. 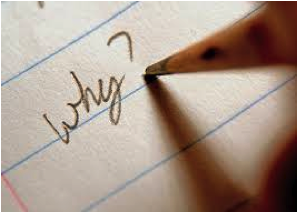 But to engender trust means to communicate the WHY.